If you listened to Teddy Atlas’s incessant claims of corruption in boxing as a result of Adalaide Byrd’s bogus 118-110 score for Saul “Canelo” Alvarez, you might have lost a bit of faith in the sport. How can two of the best fighters in the world risk so much to give the fans exactly what they’ve been craving for the last 18 months, yet fall victims to another case of dubious officiating in the sport of boxing? How can the Nevada State Athletic Commission executive director Bob Bennett defend Byrd’s scorecard as simply an official who had a “bad day”? 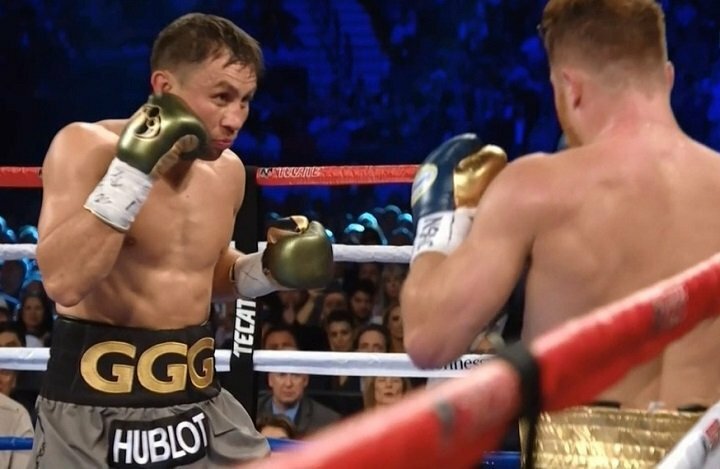 Where is the justice for Gennady “GGG” Golovkin, who appeared to just about everyone to have done enough to win more than 2 rounds against Canelo? Fortunately, the public got some justice when Byrd was effectively suspended as NSAC director Bennett stated he was “not going to put her right back in”. Nevertheless, what we saw was yet another unfortunate situation in which boxing officials robbed the fighters and the fans of the justice we all hoped for; a situation eerily reminiscent of judge Juan Jose Guerra’s 118-110 score for “Sugar” Ray Leonard in his 1987 split decision victory over “Marvelous” Marvin Hagler. But this cannot be the lasting impact from this middleweight battle for supremacy. However the problem with inept and/or corrupt boxing officials will be dealt with in the future is something that is (unfortunately) completely out of the hands of the boxing fans who had almost everything they needed to be satisfied. Almost. The ends do not justify the means, but the fact that the bout ended in a draw does not change the fact that we will likely see a rematch between the two men who gave us one of the best fights in 2017 thus far. GGG and Canelo engaged in a brilliant technical war which showcased the best of both men in ways never previously surfaced before. And although Byrd’s scorecard did not do justice to the event, Don Trella and Dave Moretti’s scores of 114-114 and 115-113 for GGG, respectively, were indicative of the type of fight we saw. It is always unfortunate when poor officiating takes away from the glamour of the fighters, but what we learned from GGG and Canelo should take precedence since they did the heavy lifting to make their long awaited September 16th showdown the spectacle that it was. Going into the fight, many of the biggest question marks pointed at Canelo. Can he take GGG’s best punches? If he can, will he be able to withstand GGG’s pressure through 12? While Canelo’s endurance in the face of GGG’s perpetual attack appeared to be questionable, he showed an amazing chin in the face of the “Kazakh thunder”. It’s very difficult to pinpoint the last time GGG was not able to hurt his opponent in the ring. Although his 23 fight KO streak was snapped in March against Danny Jacobs, he was still able to deck Jacobs with a solid right hand in the 4th and had the “Miracle Man” wary of GGG’s punches for the rest of the fight. Although Canelo began the fight cautiously, circling to avoid GGG’s power, it didn’t take him long to engage GGG in the center of the ring with quick combinations to the head and body. That was the initial surprise; Canelo’s willingness to stand his ground against GGG in the early round exchanges. What was even more surprising was seeing Canelo withstand GGG’s best punches without buckling or staggering in the late rounds, even as Canelo noticeably wilted under the constant pressure of the relentless Kazakhstani world champion. It was concerning to see Canelo so comfortable against the ropes against GGG as he was against the likes of Liam Smith and Alfredo Angulo, especially given the huge step up in power that GGG brought to the table. Although Canelo’s languishing against the ropes cost him many of the middle to later rounds against GGG, Canelo was able to remain elusive and sturdy enough to weather the storm and hold GGG off with his own attack. Perhaps going into their rematch, Canelo may have more confidence in his ability to take GGG’s best punches and will establish a more assertive tempo in the middle of the ring. This new fight-plan is strongly incumbent, however, on the Mexican’s conditioning and endurance as he appeared to suffer from fatigue in the latter rounds. It had been easy to overlook the technical skills GGG brought to the table during his fearsome, 9-year 23 fight KO streak. He had displayed exceptional boxing skills in neutralizing David Lemieux in 2015, and also utilized both an impressive jab and sound defensive ability to thwart Danny Jacobs’s offense earlier this year. While Lemieux and Jacobs are both world class middleweight fighters, Canelo Alvarez represented the first top 10 pound for pound opponent GGG has faced thus far. The question of how fine tuned GGG’s technical arsenal would be in the face of Canelo’s slippery counter-punching ability was legitimate, and was a significant area of concern for many boxing writers leaning towards Alvarez. From early on, GGG made this concern a non-issue. He quickly established a solid left job which frequently scored on Canelo and proved to be very difficult for Alvarez to counter. By the end of the fight, GGG had out-landed Canelo in jabs nearly 2 to 1, and had appeared to have stole early rounds with his consistent use of this weapon. GGG also established very smart pressure on Canelo from the onset, cutting off the ring well while not making himself an open target for Alvarez’s counters. GGG mixed up his attack very well while he pinned Canelo against the ropes, but it was evident that Golovkin neglected to employ a sustained attack to the body that might have worked well against an opponent who appeared to be feeling the effects of the constant pressure. Perhaps a body attack which had Matthew Macklin and David Lemieux writhing in pain was the missing ingredient in being able to put Canelo in serious trouble. Or maybe it would have just suppressed Canelo’s ability to come back in the last 2 rounds while GGG was seemingly ahead on the cards. Either way, GGG should put more effort into a sustained body attack when he and Canelo meet again. Canelo’s wariness of GGG’s firepower, Canelo fatiguing due to the constant pressure, or Canelo waiting too long to find the perfect counterpunching opportunities. We had seen Canelo take off portions of the rounds against lesser opposition such as Austin Trout and Liam Smith, but the difference there was that Canelo was able to maintain his position as the ring general throughout. Here, GGG was all too eager to take charge while Canelo was waiting or receding, and as a result, GGG won many of the middle to late rounds. Whether or not Canelo can flip the switch in the rematch and establish more command in the center of the ring remains to be seen. However, fighting partial rounds against a volume puncher like GGG who is at his best when he feels in control was not the best way for Canelo to go about winning this fight, and is certainly an area for improvement in the rematch.